The fact that the App Store boasts an already-crowded lineup of Twitter clients speaks to the exploding popularity of the microblogging service. Still, ask five different Twitter users which Twitter app they liked best, you might receive five different answers. Twitterena from Andrew Weekes is yet another iPhone Twitter client that’s sure to gain some fans of its own. 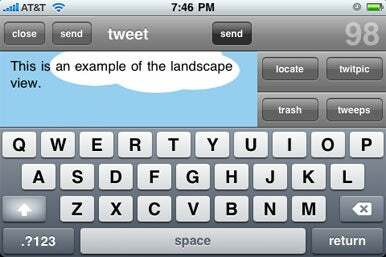 Tweeting on the Side: From its landscape view to its different themes, Twitterena has plenty to offer the iPhone-based Twitter user. Twitterena is a beautiful application. The app comes with five different visual themes—ranging from the spartan “Twitterena plain” theme to the colorful “Twitterena rainbow” theme—with each one activated by a simple swipe of the finger. The included themes feature both light and dark backgrounds for users that prefer one over the other. Twitterena isn’t the first iPhone Twitter app to use themes, but for my money, it offers the most visually appealing approach. Twitterena displays tweets, replies, direct messages, favorite messages, and searches along the bottom of the screen as most Twitter iPhone apps do. I like Twitterena’s support for a landscape mode—a welcome feature for anyone tired of typing on the tiny vertical keyboard. As users of the Twitter social networking site know, you’ll meet all sorts of interesting Twitterers that you’ll follow or that follow you. If you find someone that you want to follow, simply navigate to their profile screen and tap the Follow This Twitterena button at the bottom. I found this process very easy when I wanted to follow someone. Twitterena makes conversing with your “tweeps” easy with a “My Tweeps” page that looks a lot like the iPhone’s address book. It initially displays a list of users you’ve replied to or those that have mentioned you recently. Every time you mention a new user in Twitterena, the application automatically adds that user to your “tweeps.” There’s even an option to populate your “tweeps” book with everyone that you follow all in one step. The biggest advantage Twitterena has over other clients is its direct messages tab. Twitterena displays direct messages as threaded conversations. The results look virtually identical to the iPhone’s built-in Message app. This is a welcome addition to any avid Twitterer who has forgotten the context of a days-old direct message and has to sift back through old messages to find the beginning of the conversation. Unfortunately, Twitterena’s process for un-following someone is surprisingly confusing. You tap the same button used to follow a person. While this makes the process sound easy, it’s worth noting that the button does not change when you are already following a user—it continues to say Follow This Twitterena. I grew very frustrated the first time I tried to unfollow someone in Twitterena because I became convinced I was missing the button—it turns out that it’s just confusingly labeled. I imagine I’m not the only user who will wind up frustrated by that behavior until the developer updates the button. As I mentioned, you can customize Twitterena, but you’re not limited to changing themes; the app also gives you the option of adjusting text size and refresh rate. There’s a “magic scroll” option for unread tweets as well as controls for left-handed users. While these are all welcome options, finding them can be difficult. To change anything in Twitterena, you must navigate to your iPhone’s settings page, which requires a frustrating jump in and out of Twitterena every time you want to change an option. While testing Twitterena, I also experienced a bug which made the replies screen blank. I experienced this problem only when the “magic refresh” option was enabled in certain themes; I was always able to change themes to correct the problem. As of this writing, Twitterena supports just one Twitter account; the developer says multiple account support will be included in a future update. Twitterena brings a bright, colorful and customizable Twitter interface to your iPhone. For anyone looking for the colorful side of Twitter, Twitterena is worth a look. Twitterena is compatible with any iPhone or iPod touch running the iPhone 2.x software update.